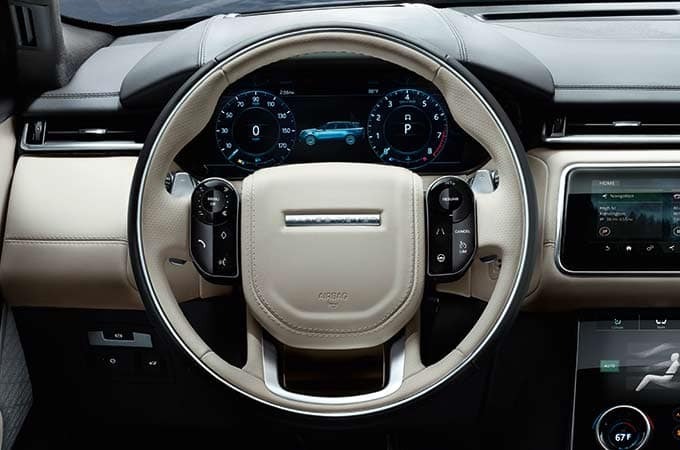 You can count on impressive performance, luxury interior comfort, and exciting innovation in whichever 2019 Range Rover Velar trim level you choose. Those all come standard on any Range Rover Velar. Choose from four trim levels to customize your Velar ownership experience to your own wants and needs. The base trim level Velar is refined and sophisticated with impressive technology and capability. Some of the exciting features at this trim level are two-zone climate control, 250w sound system with eight speakers, and 10-way adjustable seats with Luxtec and suedecloth materials. Move up one trim level to the Velar S and add on 19″ wheels, premium LED headlights, heated door mirrors, and a Meridian Surround Sound System with 11 speakers. The Velar R-Dynamic SE trim level is an innovative blend of technology and elegance. Featuring 20″ wheels, Meridian Surround Sound System with interactive driver display, Park Package, and Drive Package, this performance SUV is so amazing you don’t every want to drive anything else! The Range Rover Velar R-Dynamic HSE is the ultimate performance SUV with 21″ wheels, power adjustable steering column, 20-way Windsor leather seats, and a Driver Assist Package. The 2019 Range Rover Velar inventory is just starting to arrive! We currently have one available Velar R-Dynamic and there are more on the way! Stop by and experience the amazing luxury and performance of Velar today!